An hommage to Dimitri Chostakovich, in the form of a double fugue for string quartet where both themes are based on D-S-C-H signature. 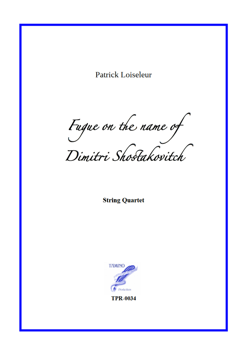 Synopsis A Double Fugue for string quartet where the two main thems are both derived from Dimitri Shostakovitch's musical signature D-Es-C-H. If you read the French language, you might want to read more in the composer's blog about that piece.